I may live in Be’er Sheva, but since moving to Israel in September I’ve been a frequent visitor to Tel Aviv. It has quickly become one of my favorite cities in the world – it has the buzz and sophistication of New York, the pace and cafe culture of a European city, and soft white sand beaches on the Mediterranean. What could be bad? Of course one of the places in Tel Aviv I always head to is the Carmel Market, the city’s frenetic shuk filled with tourists and locals, produce and souvenirs. Rarely, however, do I purchase anything. I just enjoy strolling through the hectic market, comparing prices and seeing what’s in season. It is unusual that there is something I can’t get in the wonderful shuk in Be’er Sheva, and rarely do I feel like lugging groceries home from a city an hour and a half away. This is part of why I was so excited to join Orly Ziv of Cook in Israel for a culinary tour of Tel Aviv that culminated in a cooking class at her home. After attending a cooking vacation in Tuscany, Orly was inspired to start offering culinary tours in Israel and began Cook in Israel a year and a half ago. Orly, a native Tel Avivan and dietitian by training, is also an incredibly skilled home cook and is perfectly suited to lead these tours. I thought I was familiar with the Carmel Market, but after tagging along on one of her tours last week I realized that I had only scratched the surface. Accompanied by a visitor from Singapore and one from London, my small group set off early on a Friday morning to head to the Carmel Market. Entering from the parking lot (not the usual King George St entrance) we were immediately intoxicated by the smell of fresh baked goods and so stopped to stock up on two kinds of burekas, flaky pastries filled with mild cheese. 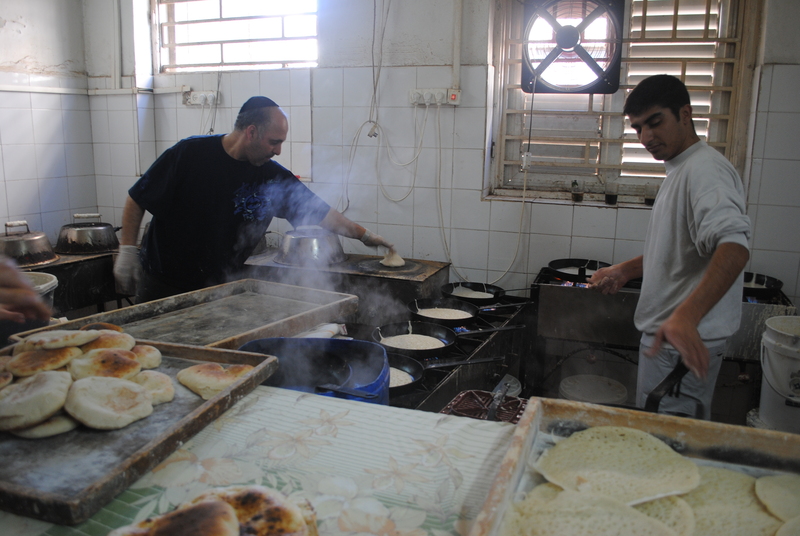 Orly continued to lead us through the back streets of the Yemenite quarter and stopped in front of a nondescript door and told us that this is where we would stop for pita. We tentatively stepped inside and found two men diligently making bread in a crowded back room. With multiple pans going over open flames they made pitas and a pancake-like flatbread called saluf. We tasted the warm, fresh bread and took some to go. A culinary tour in Israel would not be complete without hummus, and our next stop was Doron and Schlomo, a favorite local hummuseria. 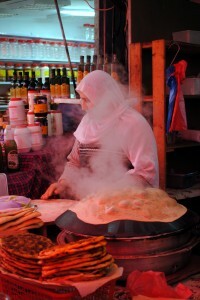 We got hummus with chickpeas and with fuul, a popular hummus topping made from dried fava beans. Fresh pita, saluf, and condiments rounded out our singularly Israeli breakfast. Orly also introduced us to cafe im hel, Turkish coffee brewed with a cardamom spice blend called kawaitch. The strong, black coffee is sweetened with a hint of sugar and the warm spices, for a dark and satisfying bolt of caffeine. Sated and awake, Orly led us to a spice store in the back streets of the shuk, where I had never ventured. She pointed out different herbs, spices, dried beans and legumes, allowing us to smell and taste them for a true culinary education. Finally, we entered the main drag of the shuk, stopping often so Orly could point out a fruit or vegetable, stopping at certain stands to buy this or that. If we were unfamiliar with something, such as loquats – a tangy Asian fruit – she would buy them so we could have a taste. Although we had just eaten, we stopped to sample the falafel at a stand in the market. 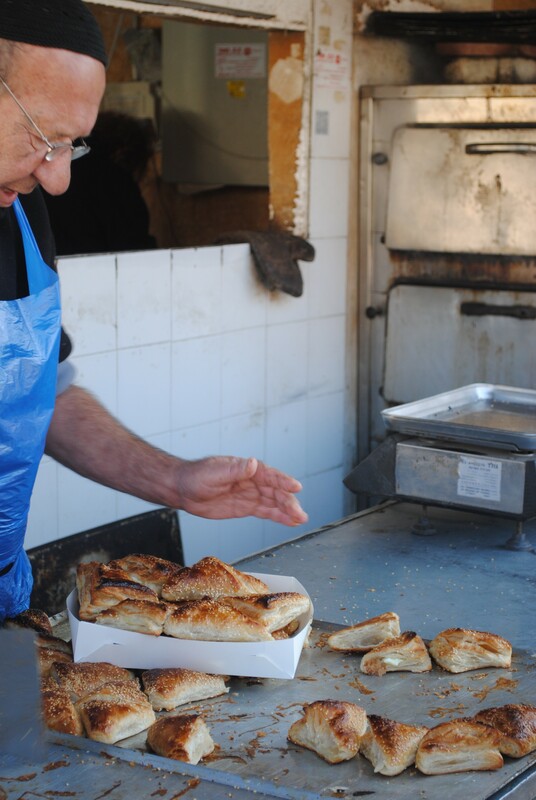 Orly also took us to a stand I must have passed a thousand times but never noticed, where Druze women made fresh bread over heated stones and sold homemade condiments and tabbouleh. We tried an amazing wrap made from the still warm, freshly made bread slathered in labne and tabouleh and folded together. YUM. Having stocked up on our ingredients, we left the market and headed to Orly’s house just outside Tel Aviv. First we stopped at a local farm stand to get some just-picked strawberries. Orly’s husband, Ben, welcomed us at the door and encouraged us to make ourselves at home. Orly put out some of the snacks from the market and immediately got to work. We were each issued an apron and a packet with recipes. It seemed like an ambitious number of recipes to tackle in a short time, but Orly gracefully coordinated each dish so nothing was rushed and everything came out beautifully. Although it can be a challenge to identify Israeli cuisine, Orly did a beautiful job of selecting a variety of traditional and unusual recipes that embody the Israeli culinary experience, which draws from many different cultures. The menu was as follows: fresh challah bread, plain hummus, hummus with herbs, two types of eggplant baladi, multi-colored pepper antipasti, fatoush salad, kitchry (Iraqi rice with lentils), chriime (Moroccan style fish in red spicy sauce), and date, fig and nut cake. All of this was prepared in about two remarkable hours time, and it all tasted fresh and delicious. I will be incorporating each of these recipes in my repertoire so expect to see some of them in the blog soon. We sat down and enjoyed the fruits of our labor with Orly and her lovely family. My day touring and cooking with Orly was lovely. I highly recommend her tours, whether you are visiting Israel for a short time or have lived here for years. I have always believed that the best way to immerse yourself in a new place is through its food and I learned so much about the Carmel Market, Israeli cuisine, and cooking. And it was a ton of fun! LOVE this post! Sounds so wonderful! 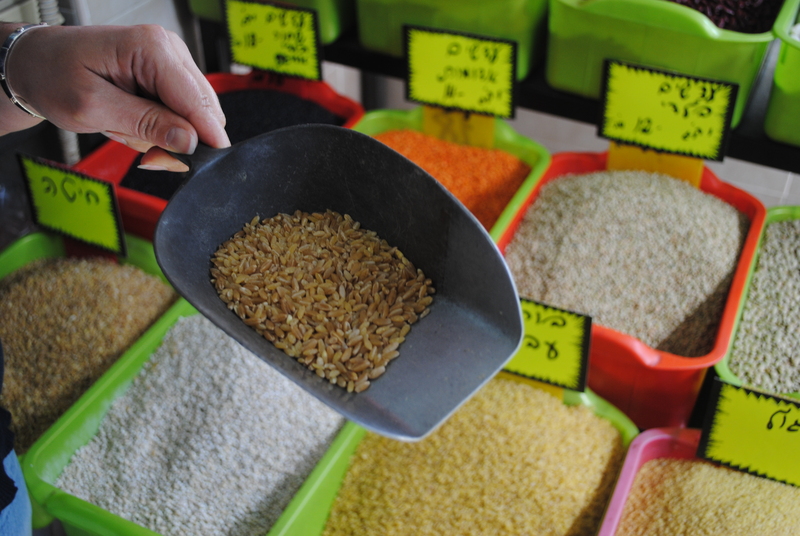 Great market photography, you’ve captured Shuk Hacarmel perfectly. Also thanks for your submissions, for some reason the form leaves the email blank. Why haven’t I seen your blog before?! Thanks Lynne! 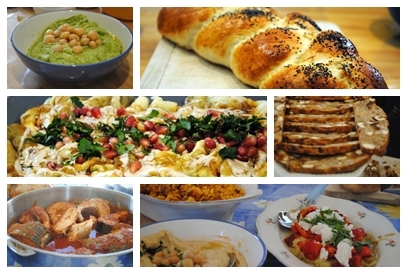 It really is a wonderful way to experience any place, and Cook in Israel is a great way to go. 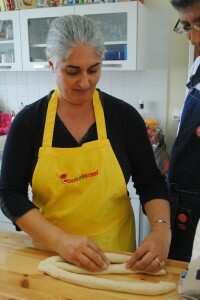 I always love to do a culinary tour or cooking class when I travel. Such fun! Thanks, Katherine! I’m planning to do the one-day or even the two-day tour. 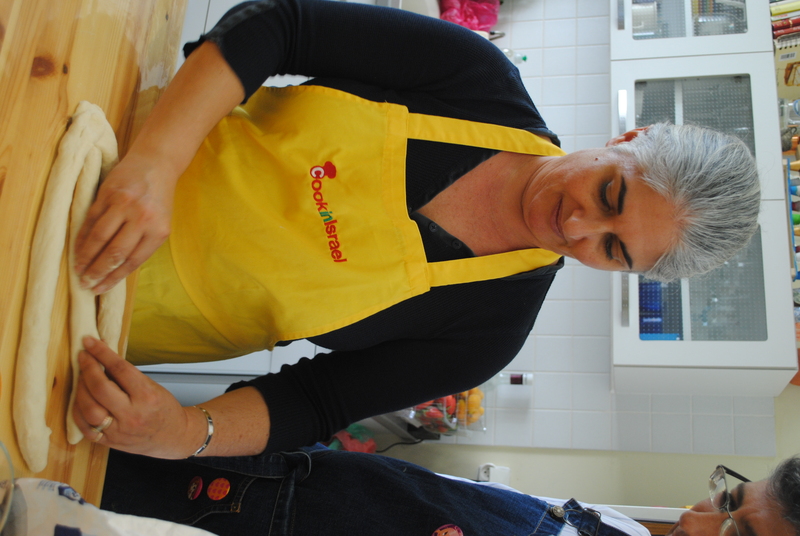 Have you included some of those recipes in your blog, as you mentioned you would? Excellent. Great question – I don’t know that I have! The hummus on my site is probably fairly similar. My favorite recipe that we made is so simple and so delicious – roast cauliflower and drizzle with tahina and date honey. It’s amazing and wows guests every time. You have fascinatingly represented the great tour of Tel Aviv in an article. 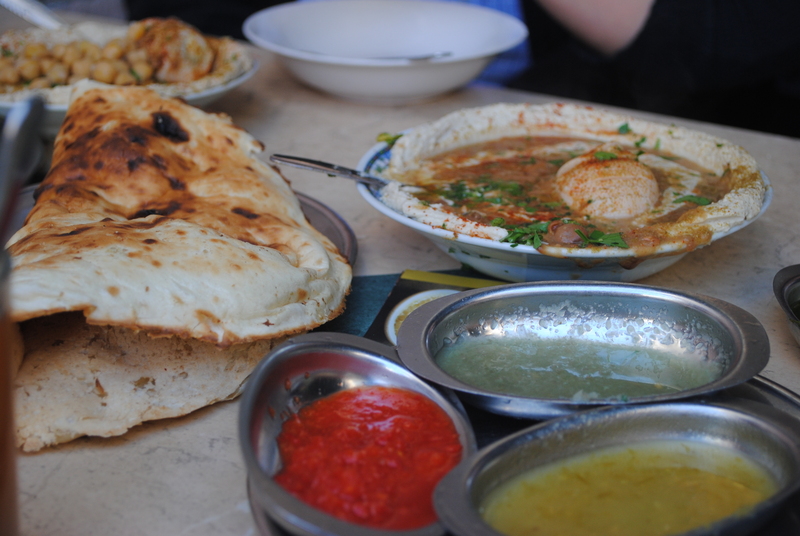 Being a world’s well known tourist destination, Tel Aviv is rich in its variety of food. You can easily get the food of your taste in every restaurant and hotels there. One can enjoy the beauty of golden beaches and delicious cuisines while staying on a boutique hotels like Shenkin Hotel in Tel Aviv. Carmel market is the best example to watch the culinary habits of travelers and locals. It is a great place to find fresh Shabbat dinner ingredients along with coffee and beer bars that attracts everyone towards it.